This dissertation is about the syntax and semantics of non-local dependencies. It focuses on wh-displacement and operator scope and addresses the challenge they pose to theoretical linguistics: How are form and meaning related and to which extent do syntax and semantics operate in parallel? A common approach of formal grammar theories is to assume that displacement and scope construal go hand in hand, and consequently to impose a strict correspondence between syntax and semantics. 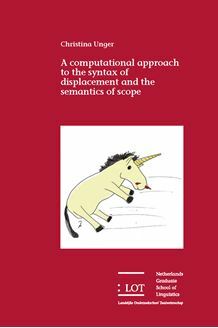 This approach is challenged, however, by a considerable amount of cases where the syntactic position of an operator expression does not coincide with its semantic scope position. This dissertation therefore pursues the opposite approach. It argues that syntactic displacement and semantic scope-taking do not interact at all. The overall picture that is developed is that grammar consists of two parts: a core system for establishing local dependencies, with syntax and semantics operating in parallel, and extensions to this core system for establishing non-local dependencies, with syntax and semantics operating independently. In developing this picture, it is shown that a substantial amount of data (such as pronunciation in wh-clusters, order preservation with multiple displacement, remnant movement and freezing, as well as different scopal behavior) can indeed be accounted for with a syntax and semantics that are largely independent from one another.